May Howlett (née Bird) was born on April 10, 1931, in Subiaco, Western Australia. She won various scholarships including a secondary studentship to study Music at Melbourne Conservatorium (majoring in pianoforte and singing), graduating in 1954 with honours in a Bachelor of Music degree, and obtaining a Diploma of Education the following year. She received extramural coaching in composition with Mr Arthur Nickson. Until her marriage in 1961, which took her to New Guinea, Howlett led a busy life as a recitalist, accompanist and ensemble pianist, and as a teacher. 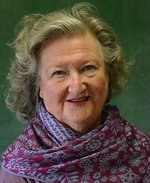 Howlett received her first commission in 1971, for a cantata to be performed at the inaugural concert of the Canberra New Music Society, and Six Meditations on the Upanishads was well received. In 1973, Howlett appeared in an ABC TV opera production of Malcolm Williamson's Violins of St. Jacques. She turned to acting and, over the next twenty-odd years, appeared in many top-rating TV shows and series, six films, at various music clubs as well as in stage productions ranging from contemporary drama to satirical revue, from Leagues Club musicals and cabaret to touring as Barry Humphries's associate artist/pianist in 1981, and taking her original one-woman show to Carnegie Recital Hall in New York in 1978. In 1987, she became a production coordinator and assistant director with the NSW Department of Education. At the same time, she started writing again (Ashes of Roses and Exhibits). In 1990, John Welch, then of Grevillea Editions, urged a return to composition, and she has since had other works published by Keys Press. It was a great thrill when Exhibits (Streeton's Noon) featured on audio tour sets as background to the text in the NGV's exhibition, Australian Impressionism, gratifying her desire to work with other art forms. In 1989, she designed and initiated two state-wide programs in drama, the State Drama Camp (1989) and the State Drama Festival (1990). These programs are still in operation, as are the Ensemble programs. In 1996, she was the recipient of an artist-in-residency at Bundanon, Arthur Boyd's Trust property on the Shoalhaven, to workshop her Fanta-s-ia, for harpsichord, viola and cello. Along with a number of other instrumental works, such as the string quartet To Times Recalled, the Fanta-si-a was published by Grevillea editions which are still available through the Australian Music Centre. In 2006, May graduated with a MA in Music from Macquarie University with a thesis entitled The Production of a Contemporary Chamber Opera, which was accompanied by a revised score, with piano reduction and workshop recording of her chamber opera, The Boy Who Wasn't There (Wirripang Publications). Her ideal was to write more music for the theatre in collaboration with theatre artists. Howlett works mainly with acoustic instruments, and, due to her background, is particularly interested in vocal writing and music which, while basically of the lyrical, tonal tradition often hides a 'sting in the tail'!. Howlett seeks to explore the more unusual aspects of an instrument (including the voice - e.g. Chataka Bird, the last movement of her song cycle Secrets, for soprano voice) as in Sacred Grove, for bassoon and marimba, without straining for attenuated effects. A Morning Canter : duet for piano (2018) Commissioned by Ann Carr-Boyd and Deborah Angus. Epilogue : viola, violoncello and piano (2011) Commissioned by Anna Hewgill. Ikons : large chamber ensemble (2000) Commissioned by Nigel Gaynor for performance by COMA Ensemble. The boy who wasn't there : a chamber opera in 5 scenes (2000) Practical component of MA thesis on the Production of a Contemporary Chamber Opera.